The sight of Richard Whitehead bounding on his blades at the Olympic Stadium, storming from last off the bend to an astonishing T42 200m victory in world-record time was one of the most memorable sights of what was a remarkable summer of sport. "It was like being in a jet engine," says Paralympian Whitehead of the noise generated by the 80,000 supporters who cheered his every step. The elated double amputee flexed his biceps as he crossed the line in 24.93seconds, ensuring millions are now familiar with his trademark 'muscle man' celebration, and his feat sparked awe-struck onlookers to swamp Twitter with oodles of tweets. "My profile has grown," Whitehead tells BBC Sport. "Not a lot of people had seen me run the 200m and the way I won showed the general public that Paralympic athletes are big and strong and want to be successful like everybody else." Whitehead, though, is not like everybody else. 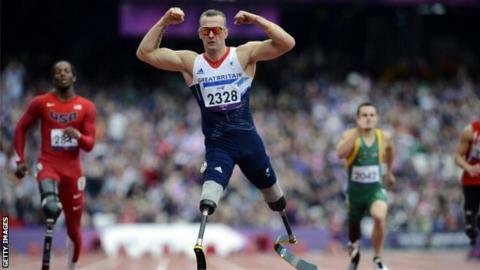 The 36-year-old, a congenital double above-the-leg amputee, is one of Britain's most versatile athletes. He is world record holder in the 200m and marathon, and was a member of Britain's sledge hockey team at the Turin Paralympics. Many would forgive the expectant father if he were to rest on his laurels, but Nottingham's bladerunner is already planning his next venture: becoming the first leg amputee to run from John O'Groats to Land's End. The former county council sports co-ordinator hopes to not only raise thousands of pounds for cancer charities in memory of his friend, Simon Mellows, who died in 2005 after contracting a secondary cancer, but wants to inspire people - although there can't be many who haven't already been stirred by his considerable achievements. "I'm a marathon runner by trade and the marathon, as an event, is accessible for anybody to watch," explains Whitehead, whose best time in the marathon is two hours 42 minutes and 52 seconds. "It's on an open road and you can just come down and be part of it, so I felt a challenge like John O'Groats to Land's End would engage people up and down the country about what sport's all about, and maybe be an opportunity for them to run a little bit with me. "It's great being on television and in the media but meeting people is something you can't put a value on and that's when you can have that inspiration and positive impact on people's lives." The Briton's long-sleeved Team GB tracksuit top is today hiding the pertinent words "cometh the hour, cometh the man" which is tattooed on his arm. But the body art, combined with the Olympic gold medal which he has placed on the table and the resolution in his words, ensures there is no doubting Whitehead will reach Land's End even though he admits next summer's task is "a very risky thing to do". After all, Whitehead is a man who was once told he could not compete alongside his school friends while at junior school because he had artificial limbs. He has overcome colossal setbacks, the most recent of which was discovering he would not be able to compete in the marathon in London because the International Paralympic Committee (IPC) said he could not race against arm amputees. Whitehead switched to sprinting 18 months prior to his home Paralympics after losing his appeal with the Court of Arbitration for Sport, adapting his training and gaining 17kg in the process as he gobbled a truck-load of protein and dairy products to undergo a metamorphosis from a slender long distance runner to a muscular sprinter. The Briton is hopeful of a rule change for Rio in four years' time, giving him the opportunity to attempt a 200m and marathon double. "They're starting to put things into place," he says. "For me, it's been a long time coming. They should look back at that ruling as a missed opportunity for them. "Sport, in some cases, is too political and they were trying to streamline athletics. Sport is inclusive, not exclusive. "To run the marathon and 200m would be a one-off and reinforce my values that sport is not all about medals. "I'm obviously a strong athlete over 200m and I would like to retain my title in Rio. The marathon, however, for me, is about opening up people's perceptions about what a person without any legs can actually do, and also overcoming obstacles and opening up opportunities for others. "It's not about being really successful in sport, it's about leaving that legacy." Whatever Whitehead's achievements in Rio, a golden letterbox in his home village of Lowdham illustrates perfectly that the Briton has already made a mark. "I wanted to have the gold letterbox in my village because it was tough for myself 36 years ago, as a disabled person, to grow up in that environment," he says. "Within that process I've had lots of knockbacks, but to have a golden letterbox there shows that time moves on and hopefully I can be seen in the village as somebody who has overcome those barriers and been successful. "It's about looking forward and being positive and not looking back and over-analysing things."